Welcome to GreenTRIP Connect. Connect helps you instantly calculate how smart location, affordable homes and traffic reduction strategies can reduce driving and greenhouse gas emissions from residential development. It also calculates how much money and space can be saved from right-sized parking. We designed this tool for you: the community members, city officials and developers who shape and build our communities. We need to grow in a way that provides more affordable homes and transportation, with much less traffic and climate pollution. Yet outdated codes and data often don’t fully account for factors like proximity to public transportation, let alone the benefits of strategies like free transit passes or car-sharing. When we don’t account for these factors we end up with excessive parking, fewer and less affordable homes, more traffic and less spaces for gardens, storefronts and community amenities. GreenTRIP Certifications have shown a new paradigm of low-traffic development is possible. Now, The GreenTRIP Connect tool unleashes the power of smarter planning and decision-making for all users. Thanks to the support of foundations and sponsors, this powerful tool is free for all to use. Connect allows you to identify a parcel of land being considered for development, and then instantly calculate the transportation benefits of locating in a walkable community near transit. With Connect’s easy to use interface, just enter a few inputs and you can then see the benefits of adding more affordable homes and strategies like free transit passes or carsharing. Connect shows how strategies can benefit the community while creating win-win cost savings for both residents and developers. Community members who want to see smarter development and less traffic now have powerful data and modeling at their fingertips. With Connect you can advocate for more traffic reduction strategies and greater affordability, using free data and reports that are easy to share and print. It also can be used to compare a particular proposal with the county average, providing data to help you support smart, well-located developments. Connect can be recommended to developers or fully incorporated into the development review process, especially since it is a free-to-use tool with tremendous potential benefits. You can also use Connect to engage residents and inform future planning at a larger neighborhood or community scale. Since 2009 cities have started to update zoning and specific plans in ways that support GreenTRIP strategies. We’re looking for more cities to join these innovative GreenTRIP Cities. 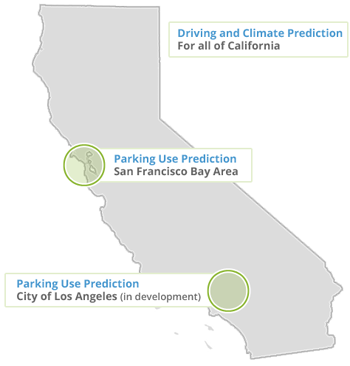 Residential developers of affordable and market rate housing use Connect to determine how much driving and GHG’s can be reduced by the project location and design. Connect also shows the benefits of providing only as much parking as is really needed. You can also use it to help evaluate potential sites for development. Now, get started by entering in a location. If it is your first visit, please take the quick tour of Connect.